At the beginning of the year my colleague, Tom Holmberg, wrote a posting on the Fireside Roll Arena at Higgins and Roselle Roads. He gave a history of the popular roller rink in Hoffman Estates noting that the business was in operation from 1975 to 1985. Since that time Steve and Judy Basich stopped by the library and allowed me to scan some of the photos in their collection. Steve is the son of Irv and Marge Basich who were the co-owners and operators of the Fireside. They had a marvelous collection of both interior and exterior shots of the building. The interior shots include photos of each of the rinks, including the concrete roller coaster that was quite a challenge. There are also photos of the front desk, the rental desk, the snack shop and the infamous Rodgers Olympic Theater organ that, for many years, provided the music that the skaters rolled and danced to. Another plus are the photos of an ingenious float the Fireside created for the Hoffman Estates 4th of July parade in 1976 or 1977. The float was in the shape of a big roller skate and was mounted on a Ford Pinto. As Steve Basich, the driver of the Pinto recalls, it was stifling hot being cooped up in the interior of that roller skate! To view the photos that the Basichs contributed to the Schaumburg Township District Library’s Digital Archive, visit the archive here. Type Fireside in the Search box and all 41 photos will pop up. Please share your memories of the Fireside with us! This week’s post is compliments of Tom Holmberg, one of my fellow Reference Librarians. After noting that people have been looking for info on the Fireside Roller Rink in Hoffman Estates, I asked him to write a posting. He was happy to comply and this is the result. Since neither he nor I ever skated at the Fireside, maybe you can tell us of your experiences there? 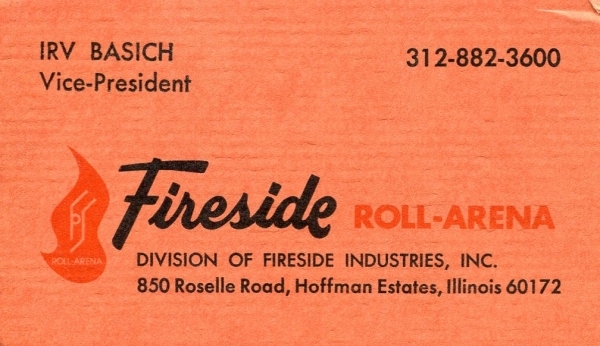 From 1975 to 1985, Irv Basich, Ray Keegan and their partners owned the Fireside Roller Arena on Roselle Road between Bode Road and Higgins Road in Hoffman Estates. Prior to the roller rink, a series of failed grocery stores occupied the site, including, for a mere three weeks, a grocery store called Guido’s which was quickly shut down when it was discovered that the ground beef contained food coloring and rodent hairs. The building was then empty for two and a half years before the roller rink opened. In its heyday the Fireside was listed in the Guinness Book of World Records as the world’s largest indoor roller rink. The skating area was reportedly 26,789 sq. ft. and the whole building was 60,000 sq. ft. (At the time two Schaumburg Township attractions were in the Guinness Book of World Records. Can you guess the other?) The rink surface was constructed of 1 ½ inch tongue and groove rock maple that had an estimated replacement cost in 1984 of $300,000. The facility included three rinks– an outer rink for forward skating, an inner rink for backward skating and a side rink for practice. The rink also boasted a $50,000 Rodgers Olympic theater organ to provide music for the skaters. By 1984 the organist was replaced by taped music except on Sunday nights when you could still hear the organ being used. One unique feature of the rink was its “roller skating coaster boasting dips, curves and angles guaranteed to exhilarate at every turn.” “We had a lot of dead space we wanted to use,” Basich told the Chicago Tribune in 1976, “so we first thought of the coaster idea for skateboarders. But after members of our family and friends tried it out, we decided to keep it strictly for roller skaters. It’s not a disco rink.” The rink also included an electronic video games area. 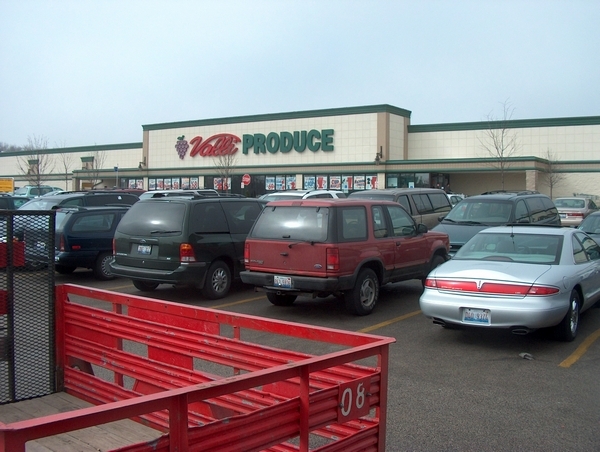 After the Fireside closed in 1985, the building became an F & M Distributors store which sold beauty, health and food items at a deep discount; it is now Valli Produce.